Teak Wood also known as Burma Teak. It is almost always dark golden-yellow. It turns to a rich brown with darker, deep brown markings as it ages. The sapwood is white to pale yellow. The grain is straight but sometimes wavy, with a coarse, uneven texture. 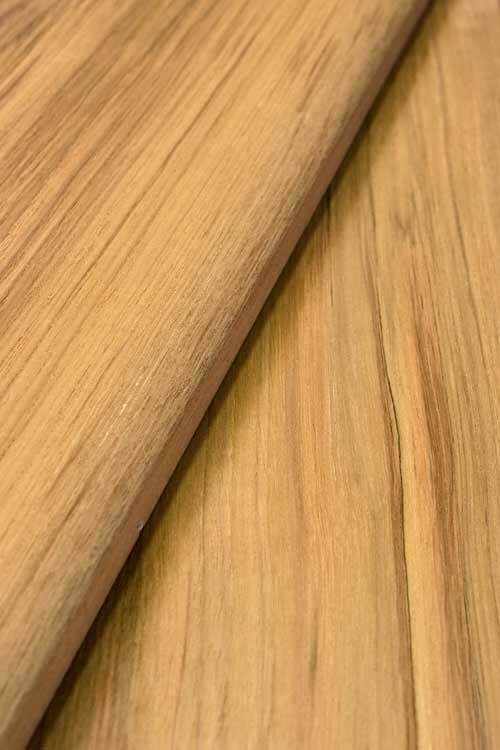 Teak is has an oily, greasy feel to the touch. Teak Lumber is a hard, medium-density wood that is strong and durable. With a crushing strength of 7,940 lbf/in2 (54.8 MPa). It is also is acid and fire-resistant. It is durable and resistant to termites and fungi. The typical use of Teak Wood is ship and boatbuilding, decking and outdoor furniture. It is also used for veneer, furniture, exterior construction, carving and turnings. If your interest in more of the details on how lumber get’s graded. You can read all about it in NHLA Rules Book. Available in 8 foot up to 12 foot. In widths from 4 inches to 12 inches and wider. Depending on current stock. Please Contact Us if you need specific widths. Most of the available lumber is grown on plantations. Burmese Teak is grown in and imported from Burma. This lumber is easy to work with. Whether you use your hands or machine tools there will be a severe blunting effect on the edges. We recommended pre-boring for nailing and screwing. Paints, varnishes and stains well.